You've survived 32 years together - here's for many more! The conductor of the youth symphony I was in during high school loved the saying "Early is on time, on time is late, and late is unacceptable." He was speaking with regard to getting to rehearsals in enough time to warm up before we actually started playing, but I find that the philosophy applies to most of my life. If I am scheduled to work at 8 AM, and I arrive at 7:59, I feel late. I feel rushed, sometimes for the rest of the day, even if there is nothing going on, and my day consists of sitting at the reference desk reading a book. I desperately need the extra 10 minutes I get when I arrive at 7:50 to get myself settled, to get my head in the work space for the day. Arriving early is a lot easier to do when you don't live 30 miles away on a busy freeway. I wish I could walk to work. I have several topics I want to blog about - daffodils for one - but I really want pictures to go with the posts. Unfortunately, for the last month I have been practically camera-less - our trusty Nikon Cool-pix began to give up the ghost. It is 8 years old, and has served us well, until January. All of a sudden, it stopped taking pictures on the normal setting. Sometimes it works OK in close-up mode, but not always... Crisis! I feel almost handicapped without a working camera. What to do? I had been promised a camera - a SLR with changeable lenses - for my birthday, but I didn't want to wait that long, and the more I thought about it, the more I realized that I don't need that much power right now. I would love it, but I doubt either of our home computers could easily deal the picture size, among other things. Instead, I asked Dad to send me his "old" camera - only a couple of years old, and a lot younger than ours. It arrived yesterday, and I have started taking pictures. So, I will be back blogging about real topics soon, I promise! We had another flat tire this morning. Not mine, this time - G's. She called and said she was at a gas station another two exits away from the commuter lot we use, and that road-side assistance was coming soon. I couldn't have the car today, because Benjamin needs it this afternoon. So, Benjamin drove me to the gas station, dropped me off, and sped away so he could get home, eat breakfast and head to class. After we'd been waiting a little while, the tow truck driver called and said he couldn't find us - his GPS had given him the wrong directions. So, more waiting - and not the last for the morning either. Once he arrived, he quickly ascertained that the spare was also flat, and recommended that we head over to Wal-Mart (ptooey, ptooey) and get it fixed. We did. More waiting. More waiting. The spare was fixable, and was fixed, but the other had been damaged too much by being driven while flat - oops - so G's going to have to buy new tires. They don't have her size in stock (Titania, her truck, takes rather large tires). We finally made it to work around 9, an hour and a half late. But, I had time to buy the wiper blades I need for my car - saves me a trip with weekend - and I have comp time left over from working on Monday, so I don't need to dig into vacation or sick leave. 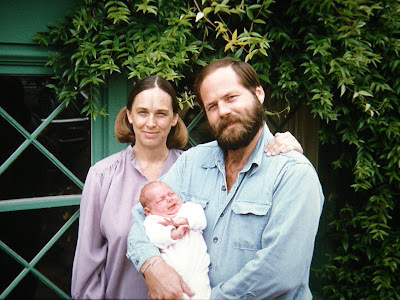 I did consider calling in sick, at one point, but the idea that I could then not blog about the adventure convinced me that it was not worth it. Aren't you glad? I have been inspired by all the reading I have done of food blogs in the past couple of days. This morning, I made a wonderful, yummy breakfast taco. Breakfast taco, a la Hope All amounts are approximate, all ingredients are optional, except the egg and tortilla - it wouldn't be a taco without these two. This is just what I had this morning. Chopped kale - spinach, sorrel, or other greens also work. Again, we had kale in the fridge. Sometimes I add edamame instead. Just getting my veggies. Heat the oil and fry the potatoes. After they are starting to brown, add the onion. Allow these to cook and soften. Add the kale and allow to wilt. While the vegetables are cooking, take some refried beans and warm in the microwave (careful, they don't take much). Spread on the tortilla. Pour the egg over the vegetable mix in the frying pan and cook like an omelet or scrambled eggs until done to your satisfaction. Spread the egg mix over the tortilla. Add tomato and cheese, and hot sauce or salsa if desired. Place the tortilla back in the pan, heat on low, to warm through. Fold or wrap, and eat. After 9 years away, Ken Griffey Jr. is coming back to Seattle to play baseball. 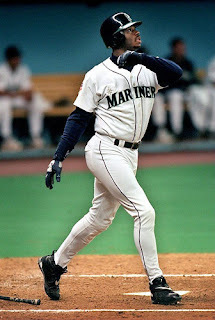 Griffey was just getting started when I began watching baseball, and during those years when the Mariners were so bad, he was the show. Dad and I would go to the Kingdome and sit in the 300 level, in the cheap seats, each with our own walkman so we could listen to Dave Neihaus, and watch Griffey patrol center field and hit homeruns. You had to have Dave, or the game wasn't the same. Mom always thought it was anti-social of us to both have headphones on, but we were sharing the same moment that way. I was sad when Griffey left, but it wasn't as bad as when A-rod left, because he didn't make it seem like a rejection (and it wasn't a money thing, it was a family thing). Benjamin asked me the other day if I would be excited to have Griffey back. Benjamin doesn't feel anything one way or the other about it, since Griffey had just left when he started watching the M's, and he has more loyalty to Mike Cameron, who replaced Griffey. Out of nostalgia, I am glad Griffey is coming back. But will he help the team? I hope so. Anyway, baseball spring training is starting up, another sign of spring! Spring seems to be coming along here in Arkansas. The daffodils are emerging, the magnolias on the capitol grounds have started to bloom, the sun is out (today anyway - it was cold and drizzly all day yesterday). On the ride in to work (G's day to drive) I saw a Great Blue Heron, a kingfisher of some sort, an egret, and a red-wing black bird. I can hear birds chirping as I eat my breakfast. As usual, any attempts I make to soothe these feelings only ends up making them more acute. Today I found my way to a new (to me) food blog out of Seattle, Orangette, and it is exquisite torture to sit here and read it at the reference desk. Food, Seattle, traveling - all things I cannot have at the moment, but all things I love. Sigh. I suppose I ought to enjoy these feelings while I can; soon enough it will be summer - hot and humid and life-draining. Then, I won't want anything, and daffodils will only be a memory. Here is Kirby, the newest addition to my menagerie. 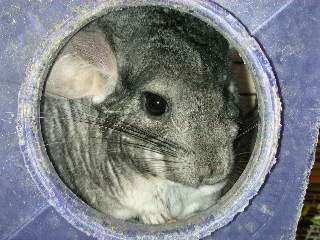 He is a chinchilla - I adopted him from the son of a co-worker. This isn't a very good photo, but he is still pretty shy, so it is hard to catch him out of his little houses. The cats haven't shown much interest in him, apart from quick peeks. Kirby makes an alarming squeak-bark noise though, when he feels in danger, and it does the trick - the cats find it very alarming! A co-worker had this on her desktop, and I thought it was hilarious. There are several versions, with different captions, but this was the first I found. Think it's photoshopped? (Sorry it doesn't quite fit the frame, but I don't want to try to fix it). Friday night we went to see one of our favorite bands - Clutch. We have seen them once before, in Austin, and knew that they would put on a good show. Their music is hard to describe - it is rock-blues-metalish, but with a dash of funny. We weren't sure what to expect with regards to the venue, since we haven't been to any other concerts here in LR yet, and we only went to a couple in Austin that weren't in the big arena. The Village was a pleasant discovery - we had seats, comfy seats! When we went to see Clutch in Austin, it was at Emo's, one of the most well-known clubs, and one of the more uncomfortable I would say. There, we were surrounded by drunk, smoking pushy fans, with nowhere to sit or get out of the way. At the Village, there was an open floor for those fans who wanted to dance and get jostled, but there were also lots of seats for those of us fuddy-duddies who just wanted to have personal space. Enough about the seats - the music. The first band was OK - lots of exuberance and enthusiasm, but lacking in experience, or talent. The music was loud (to be expected - we had earplugs) and rather relentless - they didn't know how to use space within the music to create tension and interest. The second act was a solo singer who was touted (on his website, of course) as being a great hidden, just discovered talent. Meh. The chatty fan next to us (he made Benjamin his best friend for the evening) whispered that the singer was only on tour because he had the best drugs. That might explain it. The third opening act was Clutch, but as an all instrumental band called The Bakerton Group. At one point a fan yelled out the name of a Clutch song, and the guitarist (lead singer for Clutch) responded - "We're not that group yet," an interesting existential and identity question for the philosophers among us. Anyway, the definitely rocked. Made the first group look very amateur. A great beat, interesting rhythms, lots of sound. After they finished, there was a break, and they returned to the stage as Clutch. Unlike last time, we actually knew most of the songs they played (we hadn't listened to several albums at that point), and could sing along with the other fans. Benjamin and I even got up and "danced" in our seats a little bit (a momentus occasion, since we are both rather bad at it). It was a long evening - the first group started at 8, and Clutch didn't finish until almost 12:30. We, or at least I, am getting too old for that sort of thing (not that I was ever really up to it), especially considering that I had been up since 5:30 and worked all day. But it was fun, and we had a good time. When I interviewed for my job, E. asked me what my favorite reference site was, and I didn't have a very good answer. If I were asked that question today, my answer would be The Encyclopedia of Arkansas. It has well-written articles on many aspects of Arkansas's history, along with pictures and citations for further research. I used it just this morning to help answer a question Dad had about a Japanese internment camp that was located in Rowher, Arkansas during WWII. I have used it to answer multiple questions, in fact, my own and those from patrons. So, if any of y'all want to know more about my new state, take a look. This is a slow week, at least in terms of interesting things to talk about. I have been stuck in traffic a lot, it rained a lot, there is a persistent and irritating beeping noise emanating from some part of our building. That's about it really. No cookie recipes to share, no bread - although I did bake bread on Sunday (Sunday is quickly becoming my bread day). The camera isn't working properly, so no pictures either. Tomorrow we are going to a rock concert/gig. That should be fun. Maybe I will have something to write about this weekend. We took advantage of the lovely weather on Saturday - mid 60s, sunny - to go for a hike. This time we headed to Pinnacle Mountain State Park, in part because it is fairly close. It is a popular destination, as proven by the swarms of people climbing the mountain with us. I suppose I should be happy to see all those people getting outside and getting exercise, but that happiness is balanced by the fact that there were all those people, getting outside and in my way! It is a somewhat strenuous climb, since it starts going up right away, and doesn't stop until it reaches the top. There is quite a bit of rock scrambling required, and not everyone was prepared for that. The view from the top was quite good, and worth the climb. No pictures, alas, because the camera wasn't charged up, and may not be working anyway. To avoid the crowds, we took the back route down - the more strenuous, and therefore less traveled route. Once we were away from the swarms, I enjoyed the hike much more. It is great to have something that interesting so close to the city, and while I, with my misanthropic tendencies, prefer to be alone on my hiking, I am glad that so many people were making use of it. Cream sugars and shortening. Add eggs and peanut butter and beat well. Gradually add flour, salt, and baking soda. Add vanilla. Stir in oats and chocolate morsels. Drop by heaping teaspoons onto cookie sheets and bake at 350 for 12-15 minutes. Cool on a rack. In the interest of saving the environment and my own sanity, I have recently begun carpooling to work several days a week. I serendipitously found someone who works in my building, although not in the library, who had advertised for a carpooling buddy. I called the number listed on the flyer, and we agreed to meet and check each other out for suitability. After the initial meeting we decided to give it a try, starting last week. Our first day was Tuesday, the day of the ice storm and delayed start. This was adventure #1. In the end it wasn't much of an adventure, since there wasn't any ice and we made good time coming and going. But Gwen did managed to scratch up the side of her truck (it's a big one) on a hidden pole in the parking lot. After that, for a variety of reasons, we decided to drive ourselves for the rest of the week, and try again this week. So, on Monday, it was my first turn to drive. It didn't get off to the most auspicious start when, confused by approaching the freeway entrance from a different location (we meet at a little park and ride lot) I almost got on the freeway going west, instead of east. However, with that crisis averted, we made it to work on time and found a parking spot in my regular location. That in itself was probably not the best choice, since Gwen has one of those backpacks on wheels, and the walk from the parking spot to our building takes you up a hill and across the side steps of the capitol building. Those steps are not handicapped accessible, and any wheelchair ramps there are tend to be obscured by parked cars. So she had to carry her little backpack in places. Oops. But the real fun started on the way home. I am, for the most part, a very good driver. I don't tend to speed, I use my blinkers, and I watch carefully for maniacs on the road. I have an achilles heel, however, and that is curbs. I have a bad habit of running over them on tight right hand turns. So, turning the corner onto Markham on the way to the freeway, I ran over a largish curb. At the time I thought to myself, "Whew, that was a big jolt. I hope I didn't pop my tire. Ha ha ha." A mile or so later, I began to hear a strange "whump, whump, whump" noise that I thought at first was coming from the large truck next to me. But I decided I had better pull over into a parking lot (thank goodness I hadn't made it to the freeway yet) and check it out. Sure enough, I had a flat. Now, if you know me, you know I tend to take things into my own hands and want to fix them, rather than waiting for someone else to come along. At least when I think I might have a chance at fixing it, anyway. So, I decided that I would call AAA, get someone lined up to help in case I couldn't change the tire, and then I would change the tire. I was not dressed to do such a thing, but who besides mechanics ever is? I think the last time I had anything to do with the tires I was still in college. No matter, I opened the trunk and started to get out the spare and the jack. While I was still on the phone, with Gwen standing by, trying to get me to wait for AAA, a Very Nice Man stopped and asked if we needed help. In the time it took me to get through to the correct AAA (I got routed to Washington's since I was on my cell phone) the Nice Man had the tired changed. He then followed us to the nearest gas station (the spare was low on air after sitting for 7 years) to make sure everything was OK. As he said, if it was his wife needing help, he'd want someone like him to show up, rather than a weirdo. After all that, we were able to get home safely, driving slowly. Benjamin is supposed to go buy a couple of new tires today (might as well replace them in pairs), so I can drive again tomorrow. Gwen picked me up today, and despite my show of ineptitude yesterday, is still willing to drive with me and might even have me drive her truck home on my own today, since she might have to go run errands with her daughter. I hope all my future carpooling goes more smoothly. There isn't much that can top homemade soup and bread for a good Sunday dinner. I know, roast and potatoes or something is traditional, but we don't tend to hold with such traditions (heck, we don't usually even have turkey for Thanksgiving). We just had Polish barley soup and fresh French bread. It was superb. Hearty, filling, healthy. The soup recipe came from our favorite cookbook: Twelve Months of Monastery Soups by Brother Victor-Antoine d'Avila-Latourrette. We first heard of this book through my cousin Chris, and since then have been using it a couple of times a month. The soups are mostly vegetarian, usually pretty easy, and always tasty. So yummy. The bread was just a standard French loaf from my Tassajara book, and it turned out really well. Ahh (sigh of contentment).